Bui Van Cu, a chemistry specialist in Binh Duong province, has successfully mixed ethanol into petrol in order to create biofuels. In an effort to ease the reliance on the natural resources, minimize the environment pollution and reduce the production costs, Cu have spent a lot of his years to consider mixing ethanol into petrol to generate clean fuels. In the context of the depleting natural resources, the oil price sharp increases and the serious pollution caused by the use of fossil fuels, the clean fuel technology of Cu is believed to bring big benefits to consumers, the environment and the whole society. Biofules are the products created after the process of mixing ethanol with petrol at certain ratios. The production of and use of biofuels, or clean fuel, aim to protect the environment, ensure the energy security and reduce the production costs are getting a growing tendency in the world, while Vietnam is a part of the world. According to experts, the alcohol used to create biofuels must be pure alcohol with the concentration of 99.5 percent, or anhydrous alcohol. If using the alcohol with the lower concentration, the alcohol will not get dissolved entirely, thus making engines unable to operate. The problem here is that the technology to make anhydrous alcohol in Vietnam remains limited, because this requires modern technologies and high production costs. As such, the lack of anhydrous standardized alcohol has hindered the development and use of biofuels. In fact, E5, a kind of biofuels (the petrol with 5 percent of pure ethanol), has been marketed for the last few years at the prices lower by 200-500 dong per litre than A92 petrol, which is now popular on the market. In theory, it is completely possible to generate E10 biofuel (the petrol with 10 percent of pure ethanol) and E20. Especially, it is possible to generate E85, i.e the product comprising of 85 ethanol and 15 percent of petrol. After a long period of making research, Cu and his co-workers have successfully made biofuels from ethanol with the concentration of 92 percent and higher, while no need to use anhydrous ethanol. Ethanol 92 percent means that there are 92 percent of pure alcohol and 8 percent of water in a unit. Unlike pure alcohol which allows to well mix in petrol in all conditions and at all proportions, the previous research works pointed out that if the alcohol concentration is lower than 99.5 percent, the biofuel created from that alcohol will make the engines unable to operate. In this case, the water layer will still exist separately in the biofuels and cannot get dissolved. However, with Cu’s research, the problem will be settled with a specific chemical called GEMA/TN. Cu has affirmed that with just a small volume of GEMA/TN, the water in alcohol will be able to well dissolved, thus enabling engines to operate well. 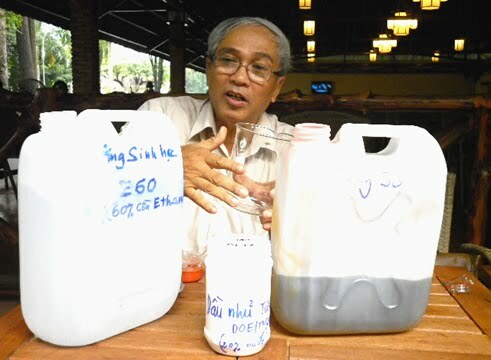 Engineer Nguyen Thanh Nhut, a co-worker of Cu, said that the specific additive GEMA/TN can make water dissolve well, which allows to preserve biofuels well: the time allowed for preserve biofuels will be long. Nhut also said that GEMA/TN can help prevent the corrosion of aluminum, zinc alloys. Especially, it can help reduce the acetaldehydes emission that can pollute the environment. This really has a big significance if noting that FAO (the UN Food and Agriculture Organization) released a research work saying that ethanol petrol may lead to the increase of acetaldehydes emission, while methanol petrol may lead to the increase of formaldyhyde emissions. Not only succeeding with ethanol petrol, Cu has initially succeeded in creating biological diesel products, including diesohol, i.e the mixture of diesel and alcohol, DOE (diesel oil emusion). “An Australian document said that the safety of ethanol-diesel is low and that it badly affects the functions of engines. However, we have come to the quite different conclusions,” Cu said. He has affirmed that his biofuels would be priceda t 16,000-18,000 dong per litre.